Writing is only one of my hobbies, however wrenching on cars is something I do professionally. But before I was even into writing, I was way too into Apple computers. Back in '09-'10, I used to make YouTube videos reviewing applications and various other Apple related topics, and one of the series was called "What's in my dock". It was inspired by many other similar video series, some of which are still on-going today. The idea was quite simple- go through your favorite apps that are sitting in the dock, and say a few words about why they deserved to be in there. Fast forward several years, and I decided to apply a similar philosophy to this new annual series of articles. Towards the end of each year, I will be going over what I keep in my tool cart, and talk a little bit more about the tools I prefer to use the most. The box itself is a U.S. General from Harbor Freight, which has served me well so far. Obviously I won't be going over every single item, but I will definitely be covering the ones I use the most. Note that I am not sponsored or paid by any of the manufacturers to review any of their tools, hence I always want to make sure that I'm getting my money's worth out of each item. I occasionally say harsh things about certain pieces (such as this Milwaukee M18 Impact that everyone seems to adore), and that's because I paid my own hard earned money for it. Then again, even if I did get these things for free, I still wouldn't pull any punches. I'll go ahead and start with my most expensive drawer, which would be the one dedicated to everything socket related. Besides what was once a $600 Snap-On® torque wrench, you'll find an inventory of Snap-On® 6-point as well as 12-point sockets and hex keys. Not seen in this photo is my 3/8" Snap-On® digital torque wrench, which is perfect for head studs/bolts, main bolts, rod bolts, and clutch bolts. Before anyone thinks that I have a lot of sockets, if you click on the right side of the image, you will see what 20+ years of working as a mechanic in a relatively niche market can do to you. My personal favorites in this drawer are actually my Milwaukee 12 volt 3/8" impact (the review of which can be found here), and my Aircat 1/2" impact. You can actually purchase a Nitrocat (which will provide an extra 50ft-lbs of torque over the Aircat) on Amazon for the same exact price as the Aircat. At the time, the Aircat was around 40 dollars cheaper, and it was and still is more than enough for me anyway. I have yet to find the need to depress the trigger all the way on this baby, as a simple hair squeeze is all that it takes for it to rip lug nuts right off. Seized axle nuts are about as bad as it gets, and even then it doesn't take much to get them off. Not pictured is my 12 volt Milwaukee ratchet, which is absolutely stunning. An honorable mention here would be my Snap-On® breaker bar, both of which have been nothing short of awesome over these years. I bought most of my hand-tools used on eBay and saved myself a big wad of cash, although buying brand new SK Hand Tools hardware will be cheaper overall, and from what I know, all of their stuff is made in the good ol' U.S. of A. The 12 point torx set is by Neiko, and is used mostly on flywheel bolts and seat hardware. The large sockets go up to 36mm, and are used to bust axles nuts and various other unconventionally large hexes. These are made by Powerbuilt. Now you may notice the alligator socket, and I want you to know that that's the least favorite/used tool in there. The socket just doesn't work for me, no matter many times I tried to give it the benefit of the doubt. Over time, it has become an eyesore, but for the purposes of this review, I decided to get it out of my secondary cart and place it in my spark-plug socket rail. To tell you the truth, it's an absolute waste of money, and about as vulgar to use as channel-locks on a brake line fitting. Speaking of brake line fittings, you may notice that I have no flare nut wrenches in my hand-wrench drawer. That's because I haven't needed one ever since I bought my Blue-Point® wrench sets. A well machined and a quality built open-end wrench such as these will perform well enough, and before any of the forum experts jump in and start throwing tantrums over how dangerous it is, I want the readers to know that after almost two years of using the Blue-Point® set, I have never stripped a single brake line fitting, and I have been working on cars as new as 6 days young, and as old as my 70-something year old grandmother. My Blue-Point® ratcheting wrenches absolutely outshine everything else I've tried in the same price range. I just couldn't find a reason to buy Snap-On®, as Blue-Point® is also covered under their warranty. The small wrenches you see in the photos are barely ever touched, and are mostly used to open small bleeder valves on brake calipers. My DeWalt crescent has been more than enough for use on fittings and nuts larger than 30mm. I mostly use the two adjustable wrenches on aircraft fittings (specifically to break loose stubborn ones). Not pictured is my 36mm wrench that I use on oil lines found on older 911s. Now before I continue, I'd like to explain why I decided to stick with a small box: One, I won't be making enough these couple years to warrant purchasing a huge Snap-On® box. The other is actually to prevent me from buying too many tools that I don't need, and while this may sound like a nonsensical reason, I'd like you to bear with me for a second. I have a major spending problem, and I have two tool carts already (the other cart will be mentioned again later). Having a cart that's small helps me buy stuff that I will absolutely need, and not just want. Then again, truth be told I still find myself going on eBay and looking for vintage Snap-On® tools, as well as browsing the SK Hand Tools catalog on Amazon, so it's safe to say that I'll have a real tool box coming up soon. Next up is my second favorite drawer, and that would be the one dedicated to diags. The ones I use the most are the big red cutting diags and the green needle-nose ones. The round tip red-handle diags are perfect for replacing the BMCs on older 911s, which require quite a bit of finesse (especially considering the age of the lines). Channel locks are mostly used to stop gas from pouring out of the rubber lines when the time comes to remove a gas tank. While it may be improper to use channel locks on rubber lines, I'd like the reader to know that the lines are usually going to be replaced anyway, considering an entire tank is coming out. And if you think that's a lot of diags, click on the right side of the picture to see my colleague's collection. Fact of the matter remains, you can't have too many diagonal pliers. The drawer above that is dedicated to miscellaneous tools and items that would otherwise find themselves in the main part of the cart. Specifically, I keep pens, witness markers (I use Sharpie® Paint markers), the small Harbor Freight pick set, and various other items that can be seen in the picture. The witness marker is extremely important, and is used to mark bolts and nuts that have been secured properly and checked for appropriate torque. And speaking of torque, you may also notice the blue 272, which I use on items that I don't want coming off until the next short to mid-term service interval. The small valve-stem tool is what I use to service my compression and leak-down gauges. If you work on or plan to work on newer European cars, the wheel hangers are a good idea. Do you need them? No. But do you really want to leave the wheel hanging on the lip of the hub when that sudden Chipotle order of yours decides that it wants out? Probably not. And since I mentioned food, I keep a fork and a spoon in my main tray, for obvious reasons. Even if it's the plastic ones, I suggest saving them for when you forget to bring utensils with your lunch. You'll also note Craftsman screwdrivers, one of the few items Craftsman claims to be manufacturing in the United States. Whether or not this is true, I am not aware, and I can only hope it is. Either way, these screwdrivers are very good, and are most certainly worth the 30 dollars they go for on Amazon. My coffee thermos is a must, otherwise I'm absolutely useless in the mornings. The little yellow trays are used to store miscellaneous hardware that can be useful on free "under 5 minute" repair jobs. In addition, I use them to store extremely rare bolts and nuts which were made specifically for the cars I work on, and are no longer sold through their respective dealerships (ahem, Rusnak, ahem). On the right side I keep my Tekton pry-bars. At first I was almost disappointed with my purchase, and I thought I would have little to no use for them. Fast-forward to this day, and each and every one of those suckers now could use a wipe of POR-15. Finally, there's the 8 dollar magnet I bought from the Snap-On® guy, and it has been the best 8 dollars I've spent on a single tool. Not only does it allow for easy access in tiny crevices, it's also perfect for cleaning out freshly chased M6 (and larger) threads. Before moving on to the drawer for large tools, I'd like to dedicate a few sentences to my beautiful persuasion bar which hangs menacingly on the left side of the cart. I was once followed by a pair of bicyclists who couldn't tell the difference between a red and a green light, and I kept this baby in my trunk at the time. The sight alone was enough to persuade them to avoid any conflict, hence the name. On the side tray I keep my paint and primer, which are used mostly for rust prevention on newly fabricated pieces. Why not powder-coat, you may ask? It actually depends on the application. Whenever I'm in charge of restoring a factory part, such as an oil tank or a set of control arms, the piece usually gets sent to one of our many local powder coating experts. For smaller items, such as pedal extensions, which are fabricated on the spot, the primer and paint will do just fine. An absolute must is my moly grease, which is used on threads, bearings, and many other questionable applications. At this point, we arrive at Jeremy Clarkson's favorite instrument- the hammer, which sleeps in the drawer dedicated to medium sized tools. And I don't just have one hammer, either. Ask any real mechanic, and they will tell you that you can't have too many different types of hammers. The rubber mallet is for more fragile applications, while the 5 pounder is for when things get properly hairy. You'll also notice the step bits, which are perfect for making holes for custom fuel lines and oil lines on race-cars. I've used this Harbor Freight set ever since I started at the shop, and they've been holding up just fine for these past couple of years. The little 12-volt 90-degree drill by Milwaukee is a soldier, and absolutely crushed my 18-volt Ryobi, which got sent home. I also use their 18-volt impact drill, as well as their regular drill. Both are amazing pieces, and well worth the buy. The impact drill is perfect for removing screws that have been seized over the years due to rust formation or any other reason. Speaking of screws, my trusty Harbor Freight 1/4" hex bit set has been one of my favorite purchases, as it offers a relatively good variety of tools for a pretty great price. I've had little to no reason to replace these with any of the more expensive sets that might be made in the same factory in China. Sadly, there wasn't much else interesting happening in my black cart, as it stores tools I barely use. Some of these are bigger (or smaller) varieties of wrenches and hammers already seen. Others are tools mostly used on my personal cars, which have little to no application on the cars I work on professionally. It does, however, store my OTC Leak-down tester kit, and I must say, what a set! I bought it on Amazon for around 60 bucks, and the price has fluctuated since. OTC also offers a compression tester, but my good ol' 30 dollar one has served me well for a couple of years now. Mind you that regardless of what brand pressure tester you purchase, the valve core will need to be serviced once every few years or so. It's good to be prepared for this, and I purchased my core off of Amazon as well, although I'm not sure it was a good buy as I feel like 6 dollars can buy much more than just one valve core. And that's about it for this year. Hopefully I get to make enough money next year and buy myself more tools, maybe even a new cart. My current cart was just not worth talking much about, as it's a very generic one that basically every other mechanic owns. I am considering investing in a larger Blue-Point® one down the road, and you best expect a review for it if I do end up pulling the trigger. Valentine's Day is only a week away, and it can be hard to shop for your partner. If your significant other is a gearhead, I'm sorry for you, because this must mean they spend more time with their cars and car buddies than they do with you, and the fact that you have stayed with them despite of this just shows how lucky they are. Regardless of gender, however, most gearheads can be rather easily satisfied with some of the presents I will discuss in a little bit. Just remember that the thought is all that counts, and you will not be dumped for getting them an extra 10mm socket, for every gearhead knows that you can't have enough 10mm sockets. Back to the topic at hand, there are tons of things you could get your partner to make them happy for the fourteenth. Matter of fact, I went ahead and compiled a list of ten things you should consider purchasing for them, and a few words as to why. Many of these things I received myself, and I am incredibly happy with them (otherwise I wouldn't be suggesting them to you). Keep in mind, I am not paid by any of the manufacturers of these products to suggest their items to you. This one's a no-brainer. You can buy your partner a GoPro for every Valentine's day, and they will still find a way to need another GoPro. I personally have one, but if I had more, I would keep two in my garage, four for my race-car, another three or so for my daily. Some may call it being greedy, but I want to capture as many angles of my life around cars as I can. Not only can the footage be used for bragging rights, but it could also be used to review any mistakes made for future references. Any Snap-On tool will do; whether it's a ratchet, or a set of allens, it can really hit your gearhead in the right spot. If you can't make up your mind as to which tool you should get them, just pick up the Snap-On corded LED light. They run around fifty bucks and are a great present for almost any occasion. They only use 25W of power and project 2000lm of light, more than enough to light up a small garage. I found this light to be perfect for when I work underneath my car, regardless of the time of day. It's easy to handle, the cord is long enough to stretch to the wall and it's ridiculously bright. I only wish they made them in the United States. 3. Any bright 1000lm tactical flashlight. I personally use a FenixPD35 Tactical Flashlight. The kit I purchased cost around $80 and included a battery, a charger and a belt holster. Now you may think, why would anyone pay that kind of money for a flashlight? Well, for starters, it's very bright for something that is mobile and fits in the palm of your hand. You can control the brightness as well, from dim to blinding bright, and it's really a blessing when working with the dash loom. Combined with a flashlight holder, it can really make any repair job ten times easier. Besides automotive work, it's a bright flashlight with a very long battery life, so it really helps to carry it around. I found myself carrying it in my holster attached to my Redwing belt, which also gave my belt another purpose. There's also the Streamlight brand, and while it is slightly more expensive, it's much easier to charge. Speaking of Redwings, here's a good one for you. If I had to wear one pair of shoes for 5 years straight, my choice would easily fall to the Redwing Boots. While expensive, the boots are less of a "purchase", and much more of an "investment". They'll last you for years and years to come, and you can have them resoled for around a $100. Redwing Shoes offers free laces as well as restoration and leather maintenance kits. You could easily spend around $400 the first time you visit a Redwing Shoes store, but remember- it's an investment. Not only are they comfortable once formed to your feet, but they're tough. Mine have been covered in hot metal from welding and cutting, transmission fluid, multi-purpose solvent- you name it. I really put my shoes through a rigorous test throughout the day, and these Redwings are holding up pretty damn well. I find myself recommending them to every gearhead I meet, and while at first they question my sanity for paying over $300 for shoes, they come to realize the true concept behind them. Not to mention, these shoes are made in the United States, so you'd be supporting the American labor force. The Ryobi Impact wrench has always been a favorite of mine for working on my car at home. It's got just the right amount of torque to bust lug nuts loose and even subframe bolts. Matter of fact, you can pick up the impact driver and wrench kit from Home Depot with a charger and two batteries for only $129 dollars, which is an absolute steal-deal. The Impact itself delivers 200 ft/lb of torque, and the batteries can last quite a while. It does help, however, to purchase the jumbo size batteries down the road. They last much longer and deliver slightly more power to the tool, allowing for even more tasks to be completed in the same time frame. Having a torque wrench is an absolute must. Whether it's a 3/8" or a 1/2", a torque wrench will prevent broken studs and also it will make sure the wheels don't fall off the car. As far as the brands go, I personally use a Snap-On Techwrench 1/2" torque wrench, and will be purchasing a 3/8" version soon enough. While expensive, the digital torque wrench can store up to three torque settings and is covered under Snap-On lifetime warranty. Much like anything else posted on this list so far, it's more of an investment rather than a purchase. Yet if you can't afford a Snap-On Techwrench, there are always less expensive options from Snap-On. 7. Racing Helmet and/or a Hans Device. While both are pricey, but they will save the life of your significant other in a crash on the track. Of course, this is assuming they even go out to the tracks. A Hans Device will prevent the neck of your partner from being snapped in a forward/backward motion. The helmet is pretty self explanatory. Each run at around $500 and are by far the most expensive items on the list, together beating the $600 Snap-On Tech Wrench. Keep in mind, however, that at the end of the day, the life of your loved one should be worth more than anything else. Of course, this is assuming you can afford these items, and if your partner hasn't bought these for themselves yet, at least try to convince them to do so as soon as possible. Fires happen, and they can spread very quickly. The Halguard fire extinguishers can help minimize damage and prevent the wiring from being deemed useless, mostly because they are use Halon. 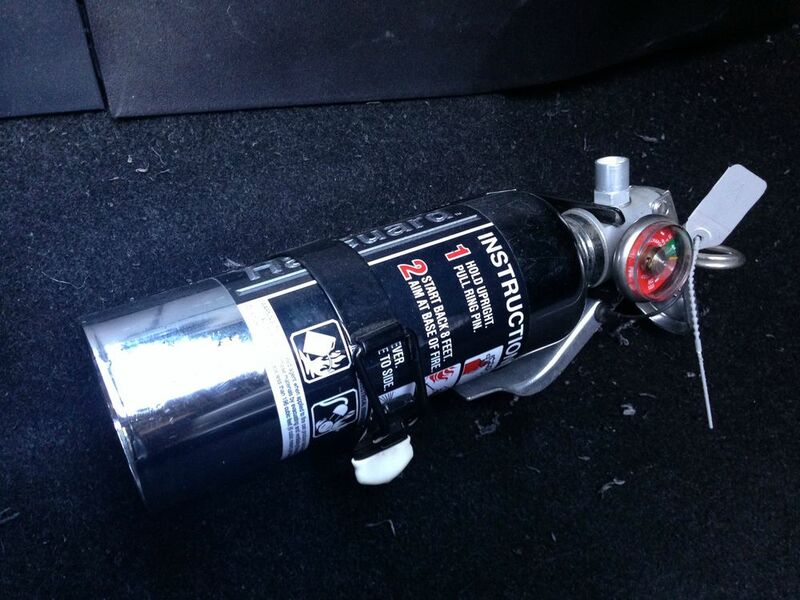 A small bottle of the Halguard fire extinguisher is around a $120, and more than perfect for a daily driver. However, if the car in question is a race-car, a proper fire suppression system should be installed, and this is something that your partner should probably address on their own time. 9. A Blu-Ray of "Senna". This is a true tear-jerker. If you haven't heard of Senna, you are missing out on one of the most amazing people in the history of racing, and maybe even humanity. Ayrton Senna was a Brazilian F1 driver who had an almost divine talent. While F1 drivers are held to a certain standard, Senna has always been on a level of his own. The documentary is a great present, and I guarantee that even if your lover knows nothing of F1, they will become attached to the story of the most incredible driver of all time. Matter of fact, they will be so addicted, they may just end up watching it more than once! Now look, I don't care how old you are, Hot Wheels® are incredible. Probably the cheapest yet one of the best presents you could pick up from your local CVS/Walgreens for this Valentine's. If your partner collects these, make sure to take a picture of their collection to avoid buying doubles. Also, please don't buy any of the generic ones; there's a huge difference between picking up an E30 M3 and getting a "Twist-rocket-monster", because only one can find a special place on the "Hot Wheels® shelf". Whatever you buy, just keep in mind that one can never have enough Hot Wheels®, so feel free to drop maybe even $40 on these.